Today Jason and I had planned to do some speed work during our lunch break. I knew it was going to be hot, but at least with the speed work you get a few rests. Right? Like I said, I knew it was going to be hot, I just wasn't prepared for how hot. The heat index was already in the low 90's when we set out on the run at 11:30. At first, the skies were cloudy and there was a strong breeze. Unfortunately, the sun came out in full force mid-run. We ran 1 mile as a warmup to a nearby park before starting the intervals. They ended up being about 1 minute each: slowly start then build speed to 80% max effort for 20 strides (about 20 seconds) then a super easy jog back to the start (about 30 seconds) so we would wait the remainder to round out to a minute. We did 10 intervals total and it actually put us right at a mile. The area we were doing the speedwork at is a grassy area that is pretty shaded. The wind really felt great when we stopped, but not so awesome when you're trying to sprint headlong into it. The mile back to the house was definitely tough since we were already really hot and the sun was out in full force. I absolutely could not stop sweating either. I took a very cold shower and tried to get ready to go back to work but just couldn't cool down so my hair was a disaster and my makeup nicely smeared. I tried to just avoid co-workers the rest of the day. After work, I did hit the gym for biceps and shoulders. My right shoulder has been really bothering me since my long run on Friday. So I tried to go easier with the shoulder work. I really don't know what's up with it - I mean, hurting my shoulder running? Anyway, I went with 2 sets of supersets done at 4x8 then dropsets at the end. Overall it was a pretty good workout. Since we were having some thunderstorms moving through we couldn't get out and grill. A grilled veggie sandwich or grilled kale and veggie salad was sounding really good too. We had our first Japanese eggplant of the season ripen up. It was just one lone eggplant though. 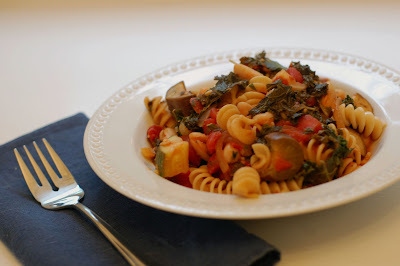 So I ended up making a veggie pasta with it along with zucchini, onion, red bell pepper, and some kale. Basically you just saute a thinly sliced white onion with garlic until translucent. Add in white wine and/or vegetable broth. Allow that to simmer then add in your bell pepper and allow that to soften. Next you stir in tomato paste, tomatoes that have been mostly drained and the rest of your veggies and any protein (like cannellini beans, which I used tonight). I stick to a very basic Italian style seasoning using basil, oregano, parsley, salt, pepper, red chili pepper flakes. It's really super simple because you can use whatever veggies you have on hand. There is something I wanted to talk about briefly. It wasn't something I'd planned to discuss at all tonight actually. I was just planning to do my typical posts, the ones I often question why anyone even reads. There are so many bloggers out there putting out meaningful, well-thought out, inspiring posts almost daily. Me? I just yammer on about my workouts, what I cook, sometimes complain about injuries or silly nonsense that happens during a day. I try to stay upbeat, but absolutely real, honest. Always. And there are many times recently when I question blogging. I mean, why would anyone read what I have to say? Why does it matter? It takes up so much time too. But in the end, I can't give it up. Why? The people I've "met" through blogging. The inspiration I receive daily. The support group. So where is this all coming from? If you ever think that what you do and/or say doesn't matter, think again. While I don't see myself as inspiring, I've been told that I do inspire. That's very humbling to me. Sincerely humbling. And I guess this was all brought on by a post from Melissa at Live, Love & Run. In her vlog today, she thanks all those bloggers that have become a support system or a source of inspiration. And she mentioned me. Me? Of all people. Again, humbling. And grateful. So you may never really realize it, but you could be inspiring someone today with your words, your actions, a smile.